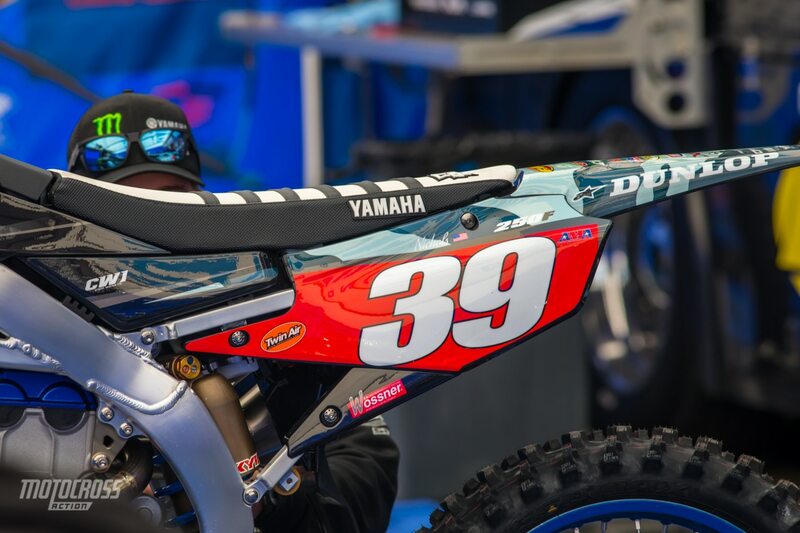 Cooper Webb ran the red plate for the first time in his 450 career in San Diego. He left San Diego without it. 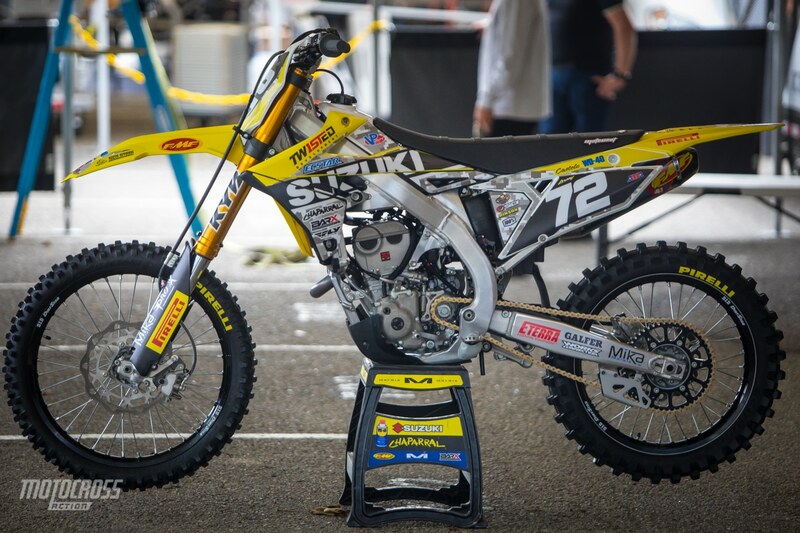 So far the 2019 Supercross season has been an exciting roller coaster ride and we are loving it! Round five was held inside Petco Park. 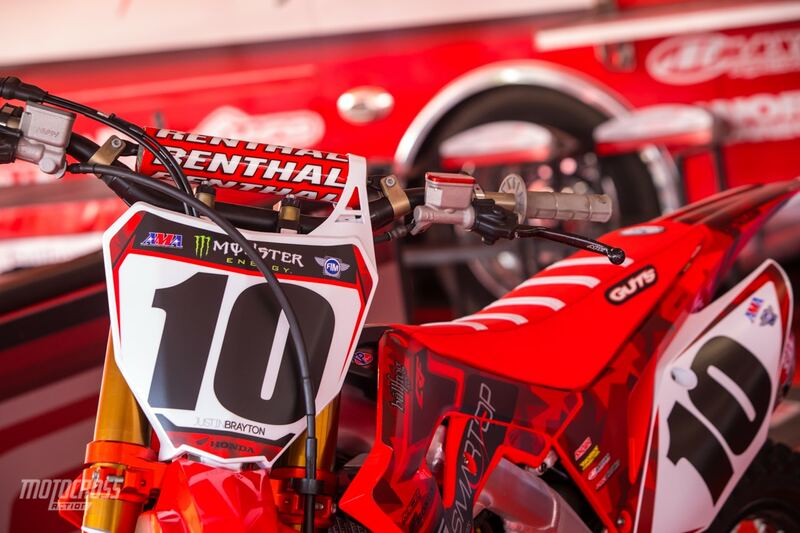 MXA is in San Diego to document all of the excitement that went on at round 5. 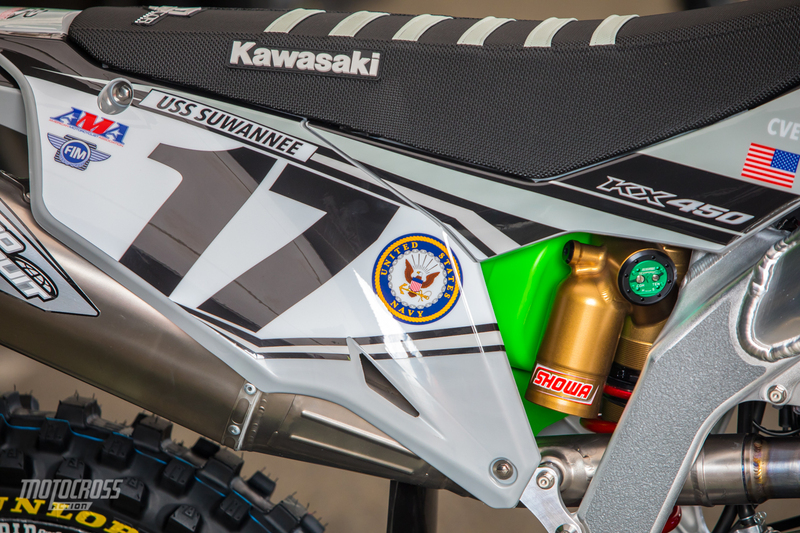 While we were waiting for the racing to start, we hit the pits to get up close and personal with all of the cool Military appreciation themed bikes. 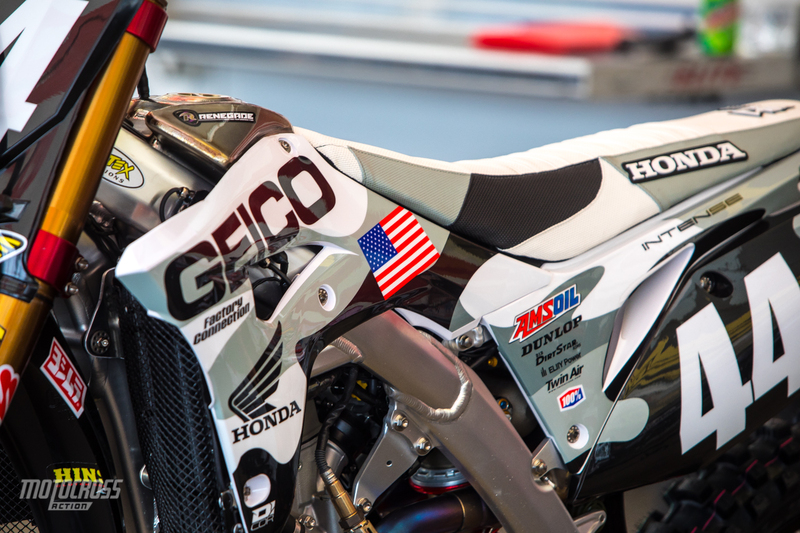 The Geico Honda team went all out for the military appreciation night. Check out the factory titanium gas tank. The Pro Circuit team went all out as well. 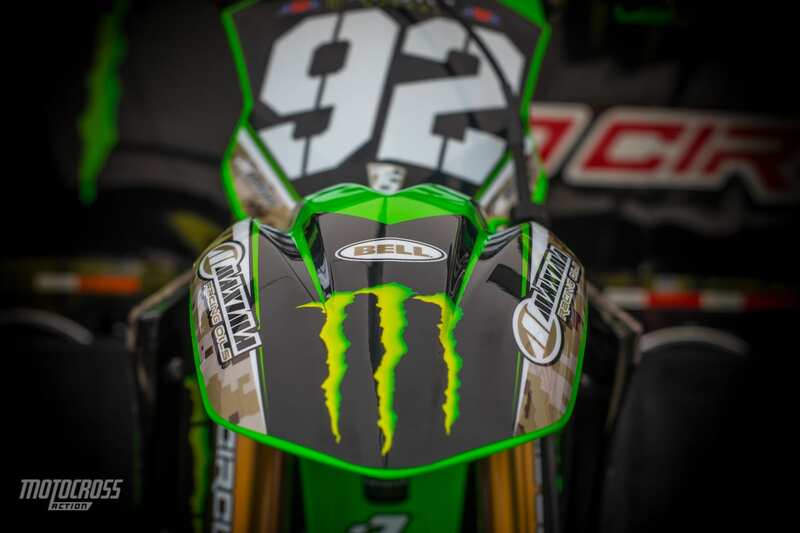 Even Adam Cianciarulo’s numbers are military themed. 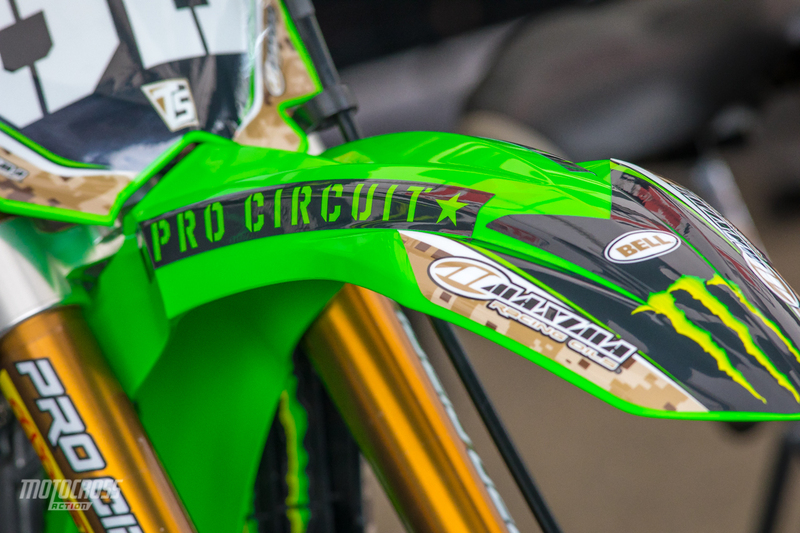 Up close to the Monster Energy Pro Circuit Kawasaki KX250. 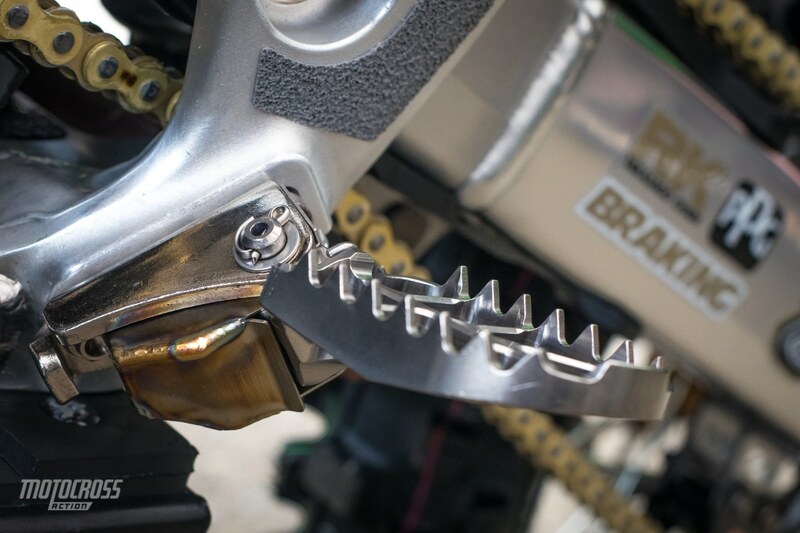 How cool are these foot peg? They are designed specifically to keep mud out. Even the bell sticker on the front fender matches. 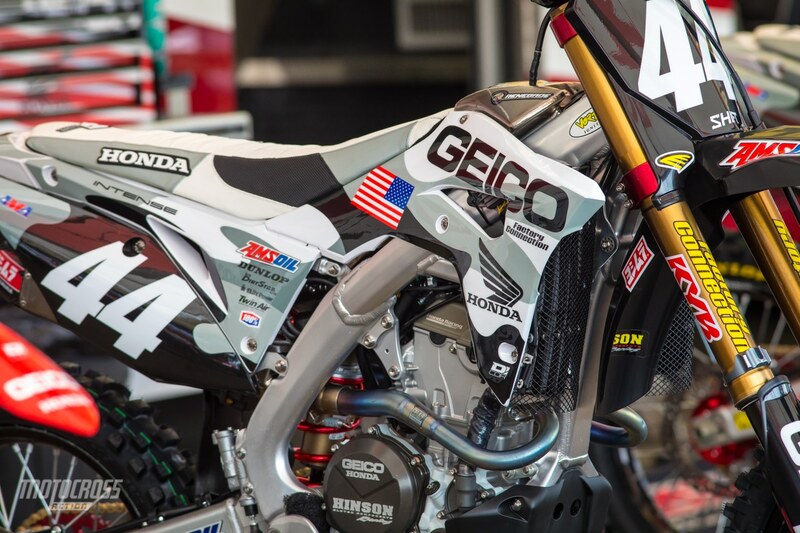 Check out the sand color that’s mixed into the graphics on the shroud and front number plate. 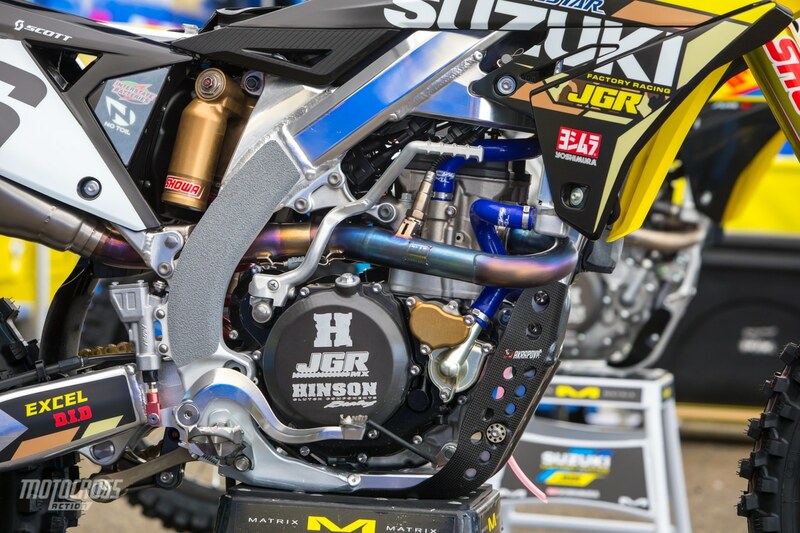 Up close on Justin Hill’s shiny JGR Suzuki RM-Z450. 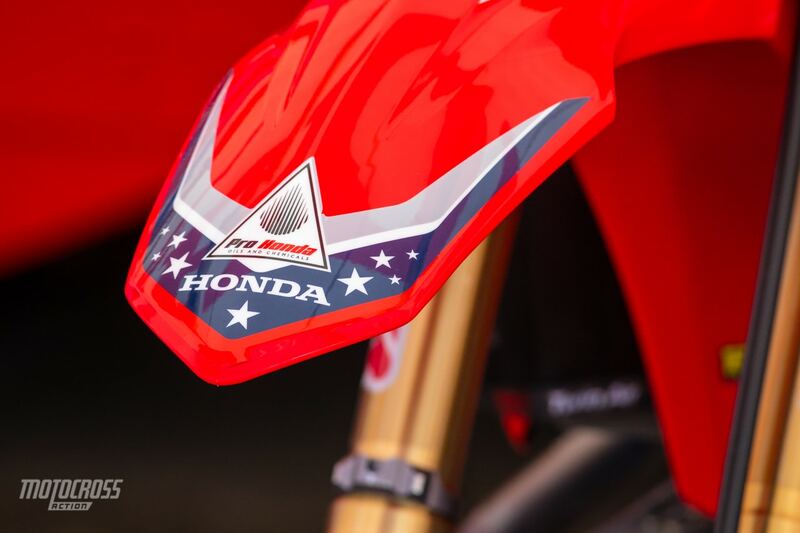 Cole Seely’s HRC Honda is looking really cool too. We love the red, white and blue seat. Also the stars in the graphics. 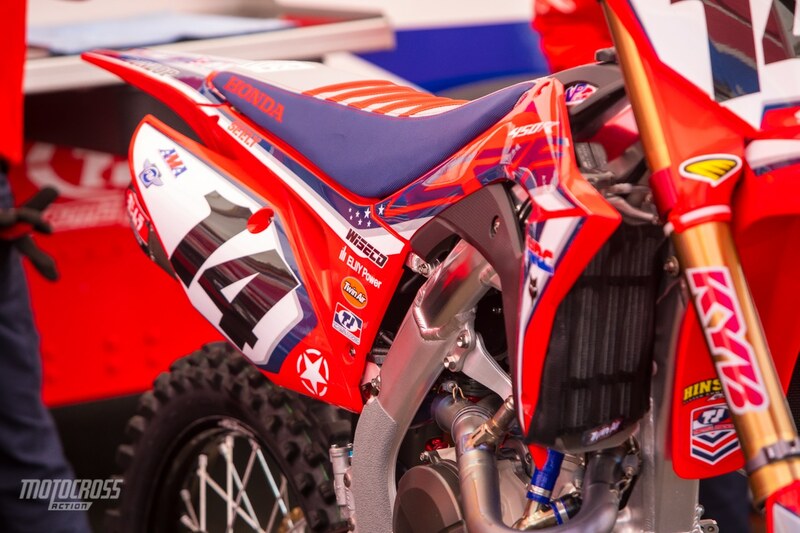 More stars on Cole Seely’s bike. 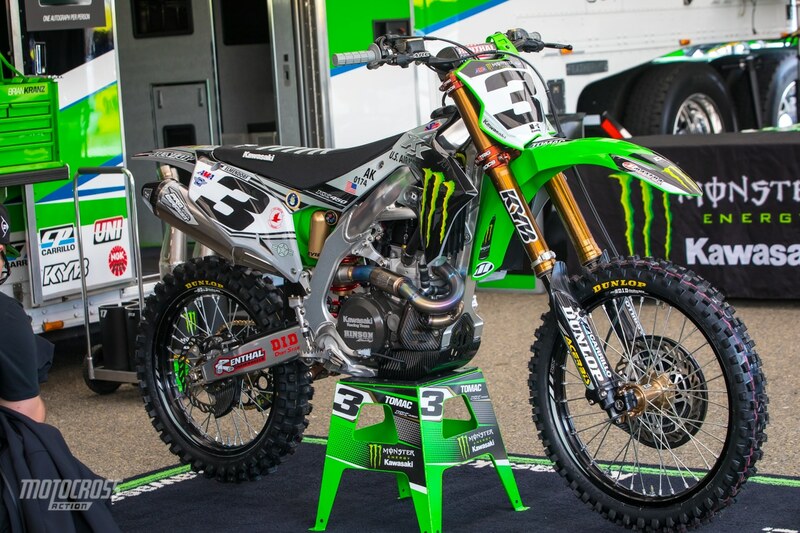 Joey Savagty’s KX450 is similar to Eli’s, but when you take a closer look, Joey’s has U.S. Navy logos on his bike instead of the Air Force. 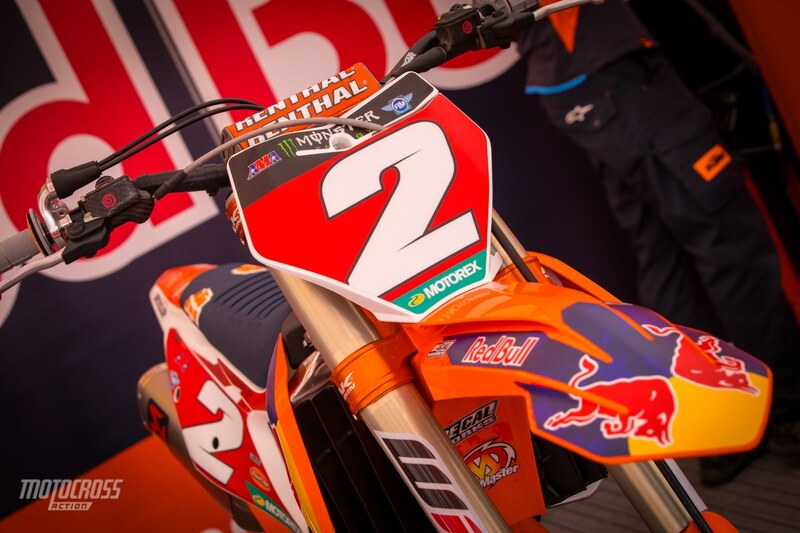 Up close on Savagty’s number plate. 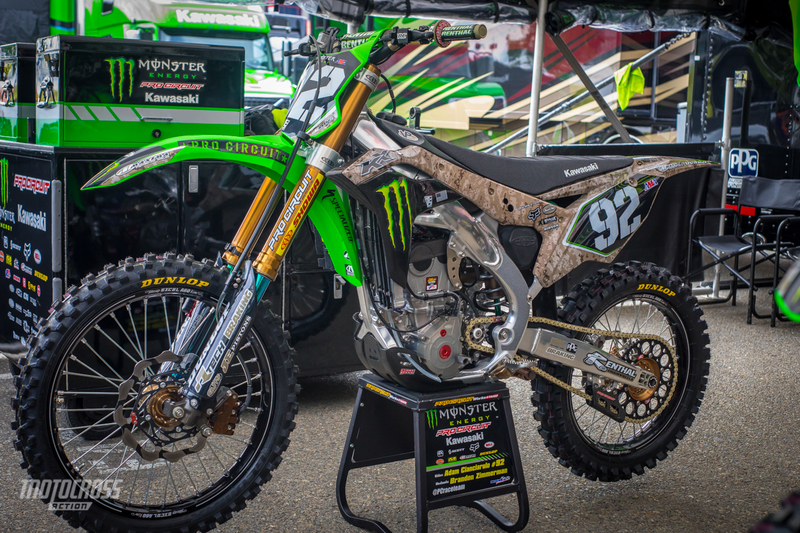 Justin Brayton’s Bullfrog /Smartop/ MotoConcepts Honda CRF450 had red camo. Many teams have brought two different bikes for their riders. One for the rain and one if the rain isn’t bad. 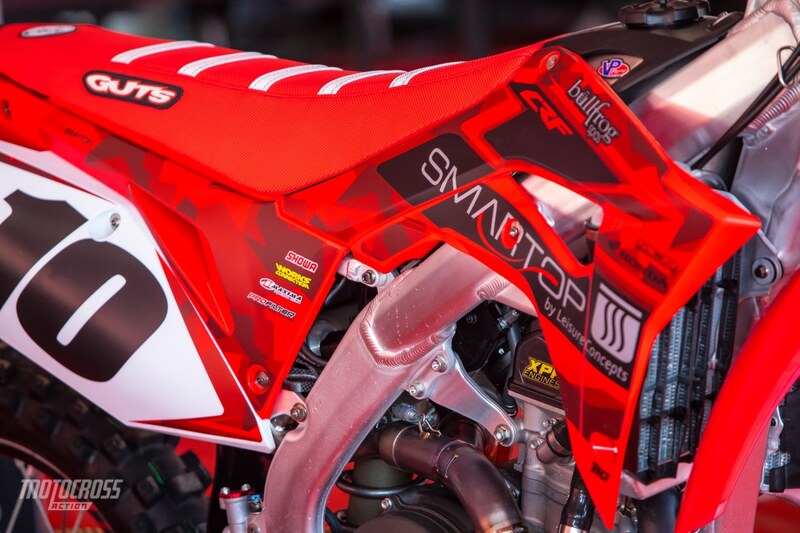 The Smartop Honda team used their practice bikes when it poure down rain. 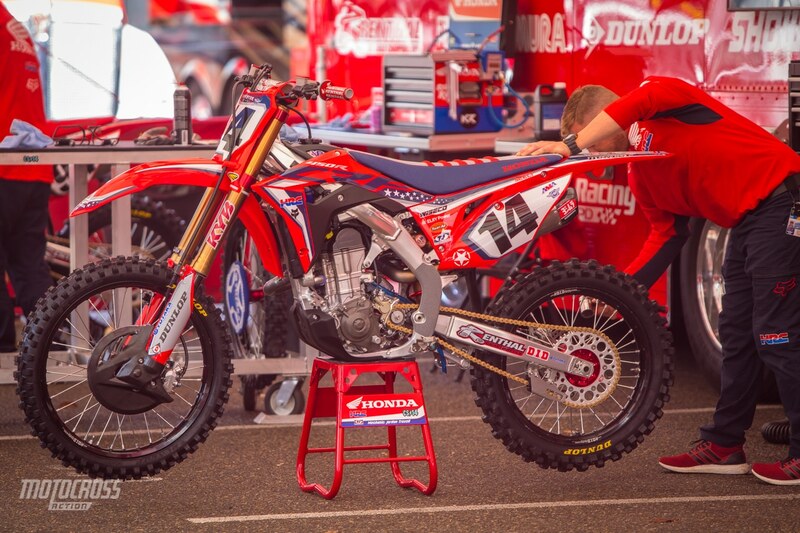 This is Brayton’s race bike. You can tell by the hydraulic clutch. 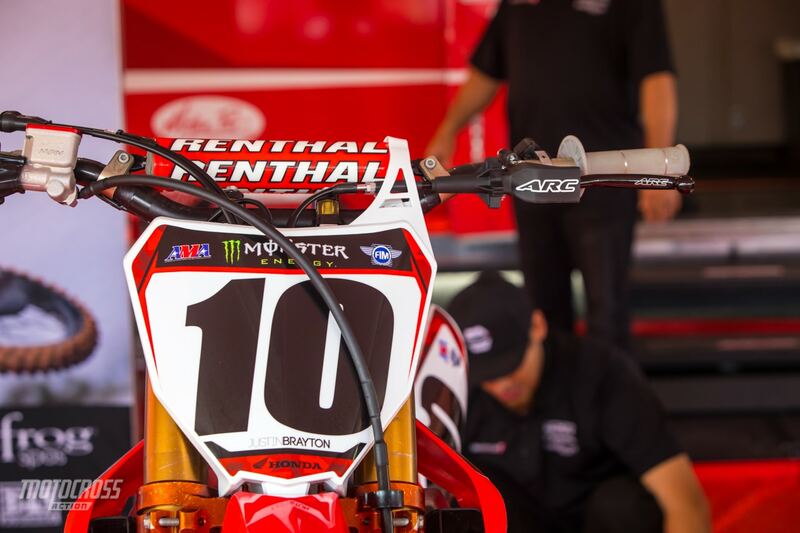 This is one of Brayton’s practice bikes with the regular cable clutch that he will elected to race when it poured. 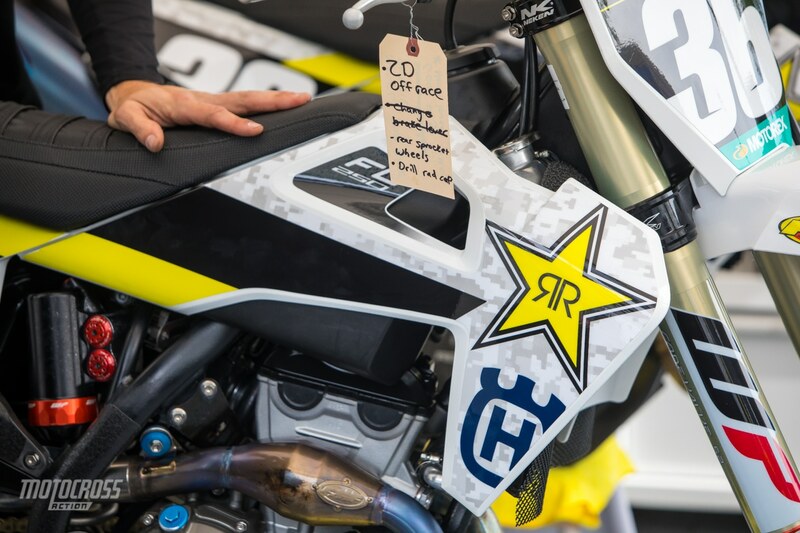 Michael Mosiman’s Rockstar Husqvarna FC250. 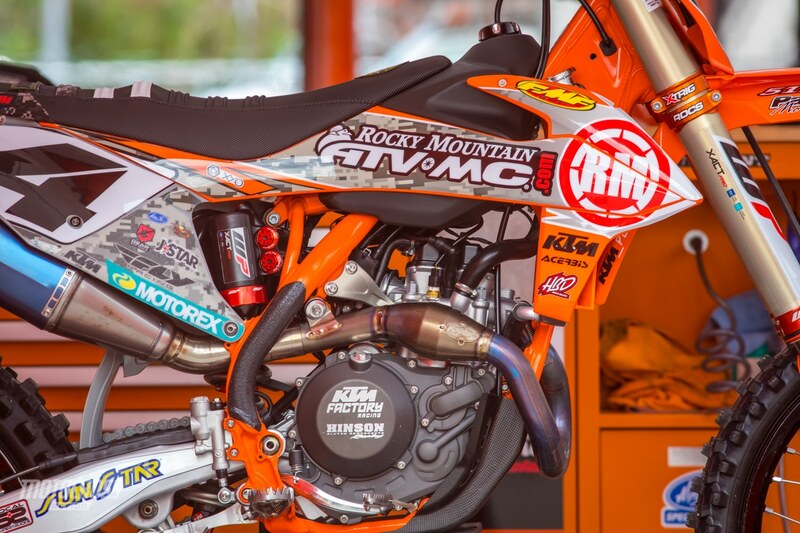 Blake Baggett’s Rocky Mountain ATV/MC-KTM-WPS 450SXF. 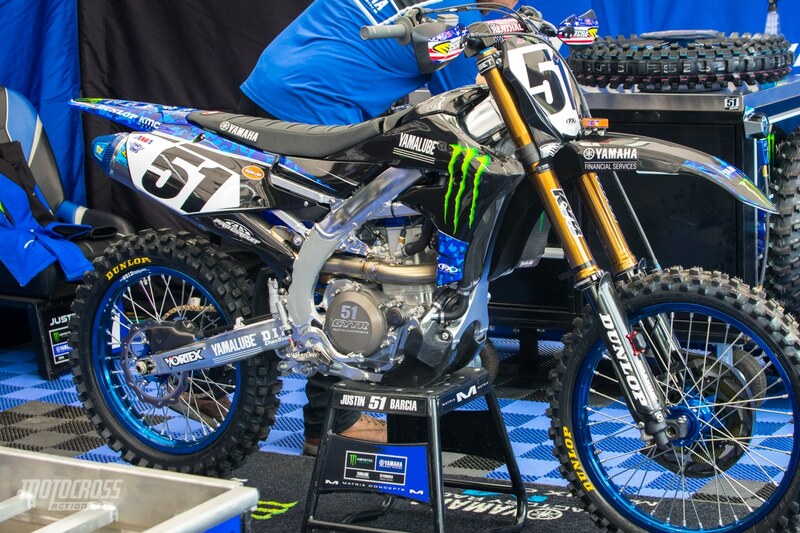 Justin Barcia’s YZ450 was ready to play in the mud. But in the end, he ended up not finishing the San Diego race. 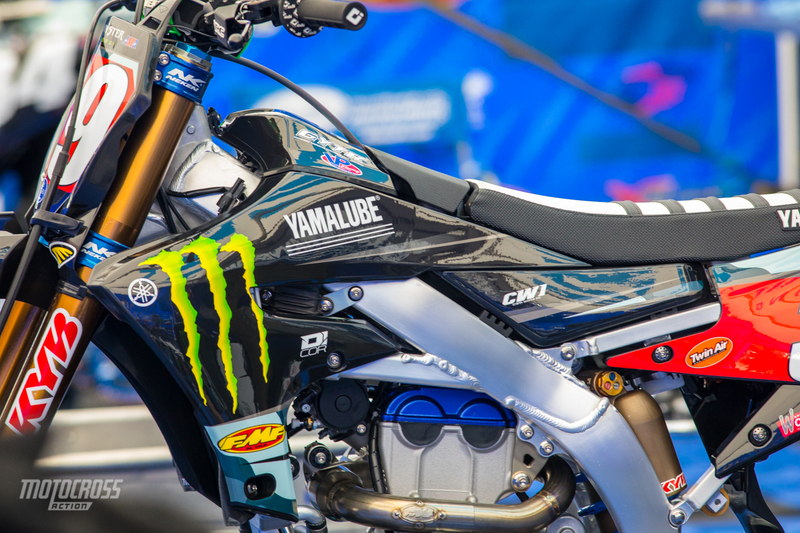 The Monster Energy Yamaha Factory team remembered all the details! 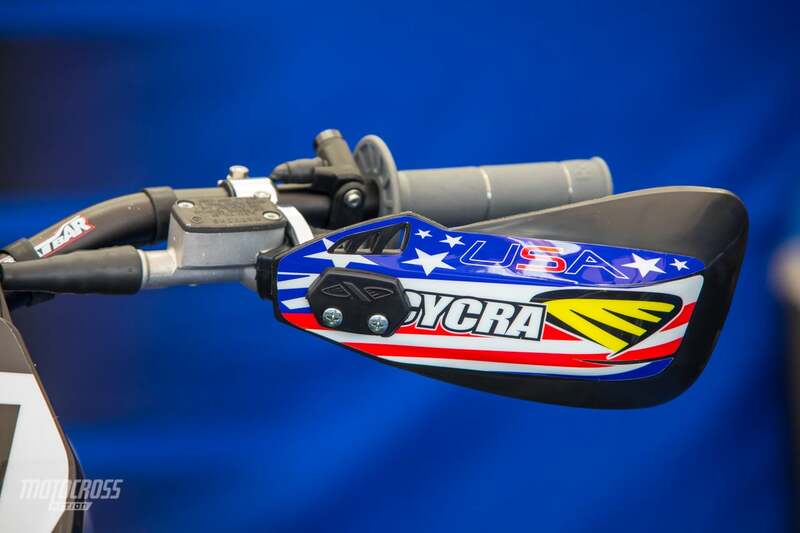 Justin Barcia’s Cycra hand guards are cool! 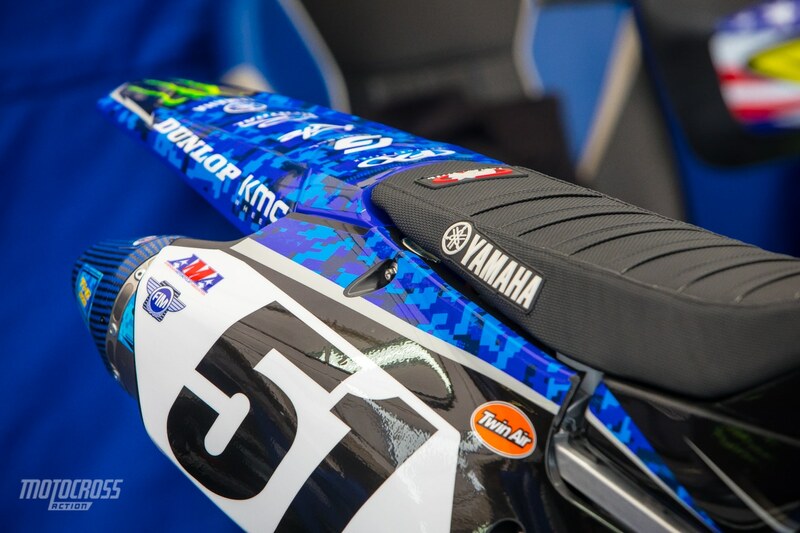 Even Barcia’s Pro Circuit exhaust has a matching blue carbon tip. 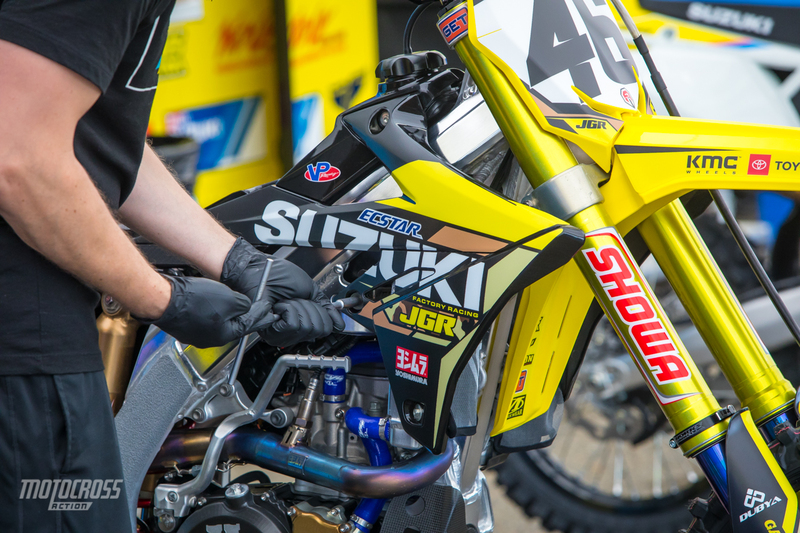 Martin Castelo’s BarX Suzuki RM-Z250. 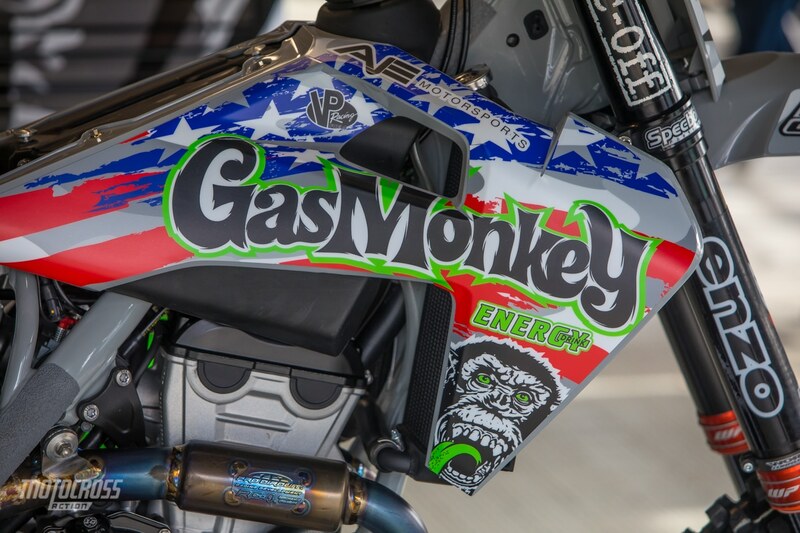 The AJE Motorsports Gas Monkey Energy Husqvarna graphics stand out! Chris Blose was their only rider at San Diego. His teammates Justin Starling and Dylan Merriam both were injured. 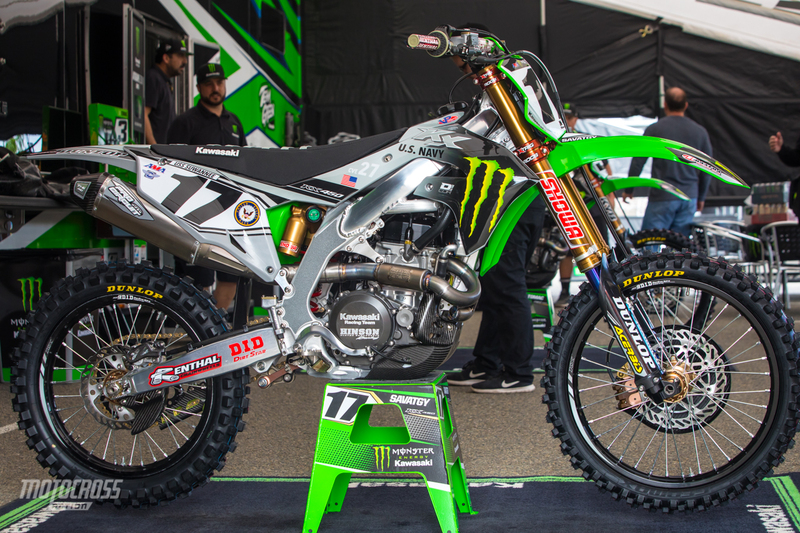 Starling expects to return for the first East/West showdown at the Atlanta Supercross and Dylan is unsure when he will return. 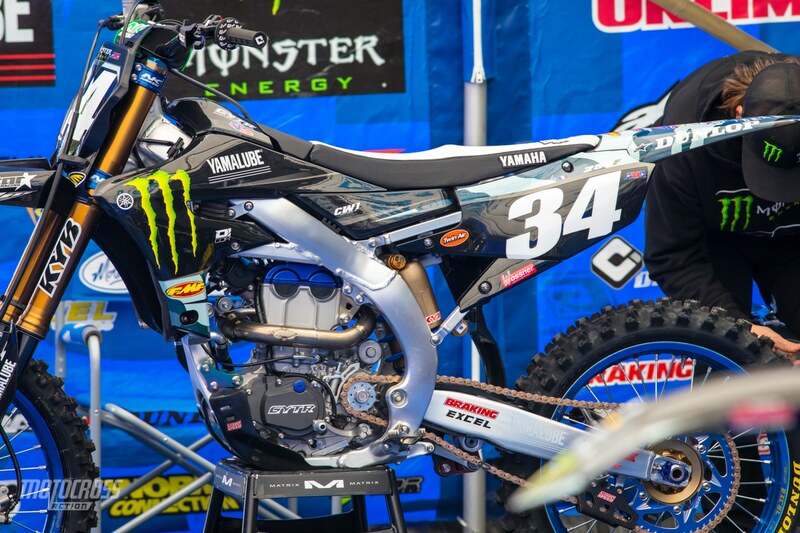 Dylan Ferrandis’ Monster Energy Star Racing Yamaha bike had a cool color mix. It was so clean… But not for long. Colt Nichols will ran the red plate for the four races in a row. He will not be wearing it next week because the 250 West goes on a break and the 250 East start in Minneapolis. 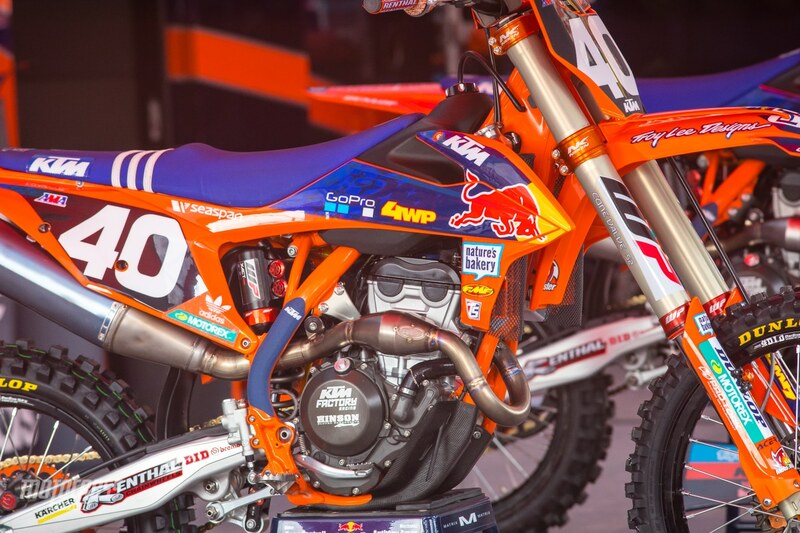 The Red Bull KTM 450s had just the slightest bit of camo design in their graphics. But you have to look closely to find it. 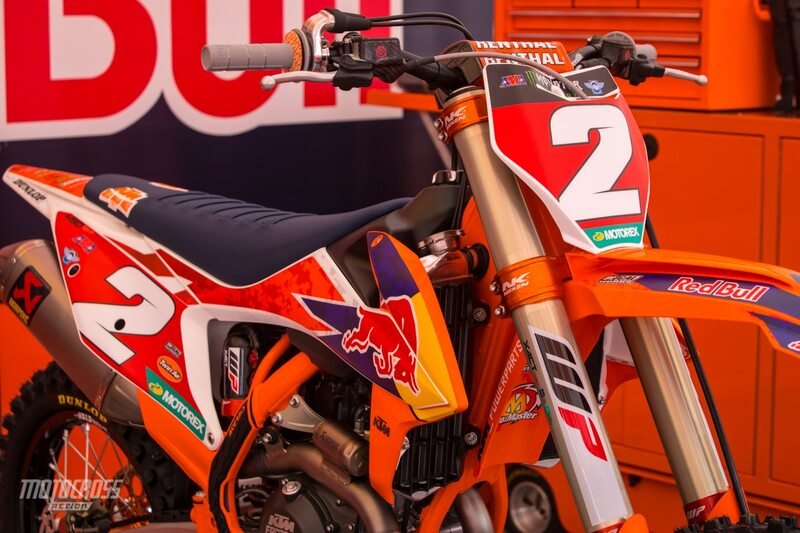 Marvin Musquin’s bike is ready. 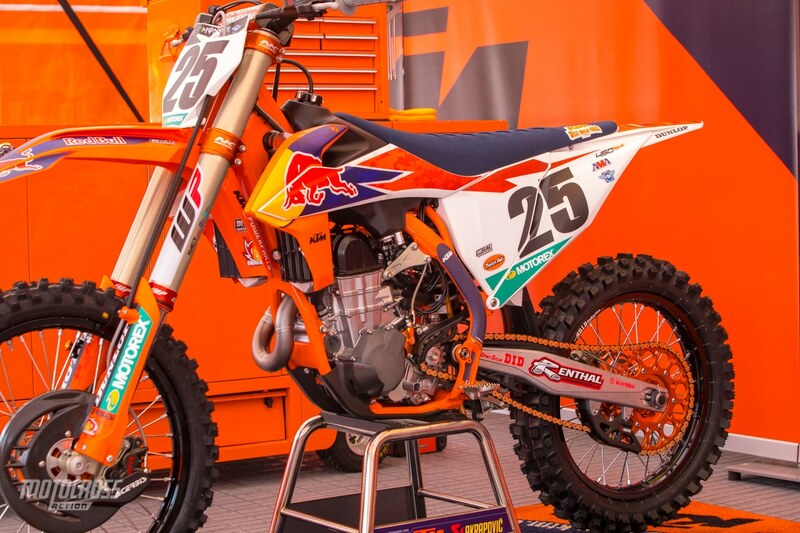 Similar to the 450 team, the Troy Lee Designs Red Bull KTM 250s only received a little bit of camo.